Kathy Newton, Office Manager at Word of Life Assembly of God, said that more than five PCT hikers a day have been stopping at the church, most of them within the last week. All together they have hosted between 35 and 40 hikers. On Father’s Day June 17, there were five hikers. One from Australia, one from Switzerland, one from England, and two from the United States. Sandra Withrich from Rotherbach Switzerland began her hike from the southern terminus of the Pacific Crest Trail in Campo on April 2. Gordon Forrest from Brisbane Australia began his northern trek on April 4. The two met at Warner Springs, about 110 miles up trail and have been hiking together, averaging about 20+ miles a day, ever since. They are thru-hikers. When Sandra met Gordon he was hiking with an Israeli hiker. The three of them hiked together until their Israeli friend left the trail. Gordon and Sandra hiked up 14,800 foot Mt. Whitney and over Forester Pass. Forester Pass is over 13,000 feet and one of the most difficult passes of the trail. They were able to continue on through the Sierras without delay because the snowfall has not been as high as last year and the heavy snow melt that swells the rivers had not yet begun. They said that hiking through the snow had not been too difficult for them, although Sandra did have one incident when she fell into a post hole and it took hours to get out. Gordon explained that he and Sandra both have 6 month visas so they want to keep a steady pace hiking the whole trail to Canada. Some of the American friends that they have made don’t have the same time constraints so they have been skipping north and then hiking south. As a result they have met some of them that they hiked with coming back the opposite direction. 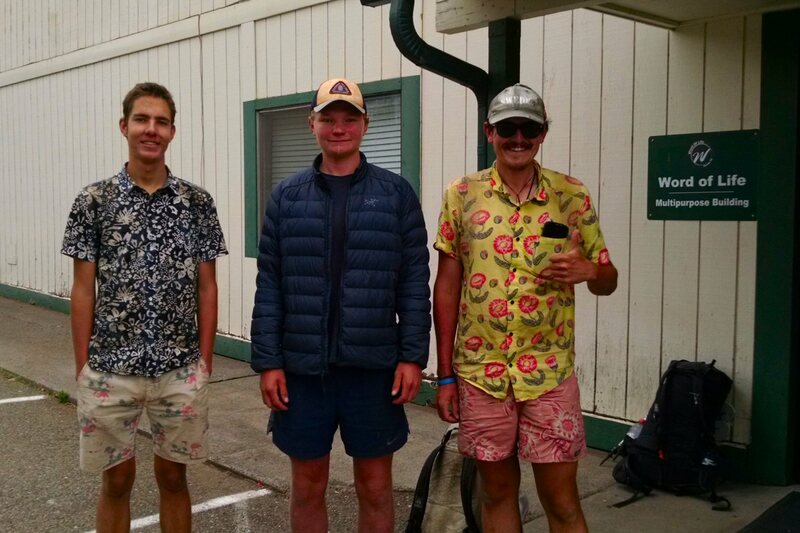 Three other young men who spent the night in the WOLA gym are Oscar Chubb (trail name “Statue”) from the United Kingdom, Julian Casola “Swede” from New Jersey, and Sean Harran “Caca” from Boise Idaho. Nineteen-year-old Oscar Chubb recently graduated from Denstone, a public school in England. After hiking the PCT he plans to attend Royal Military Academy Sandhurst and serve in the British military. “Caca” is also 19. “Swede” is 24. He began the hike from Campo on March 20. Oscar began on March 21. They said that hiking the deep snow through the Sierras was challenging. “Swede” said that sometimes you fall through the crusted snow and find that you are waste deep in water running under the snow. They also said that you need to be careful not to fall into post holes. Several of the hikers attended the Father’s Day Sunday Service at the church. Pastor Ken Frazier welcomed them followed by applause from the entire congregation. Rev. Frazier said that he is glad that WOLA can provide a place in the gym for them to sleep, a hot shower, a hot cup of coffee, and some supplies. 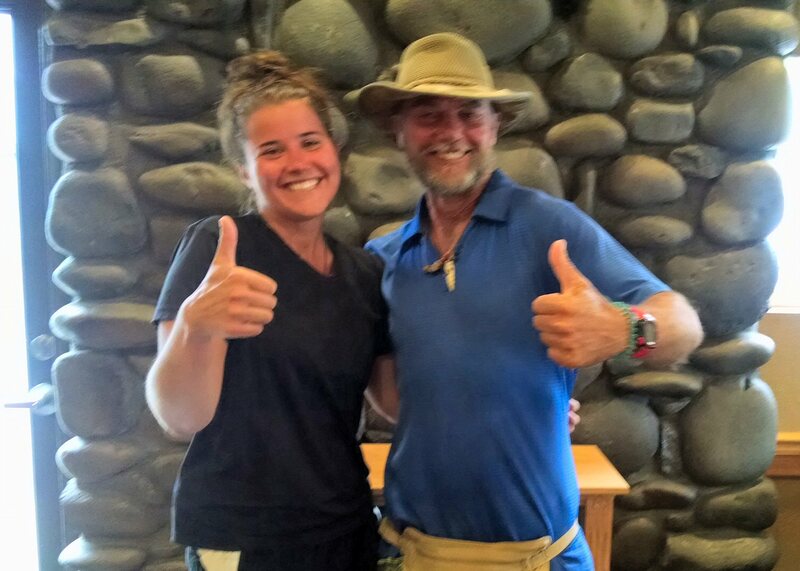 He encouraged people who would like to provide “trail magic” for PCT hikers at the church. “Trail magic” is supplies or treats that might be helpful for hikers. If you would like to provide “trail magic” contact Kathy Newton at 334-4419.